Many of you have watched as Edgewood’s Father’s Day Car Show grew to a size which called for larger exhibit space. 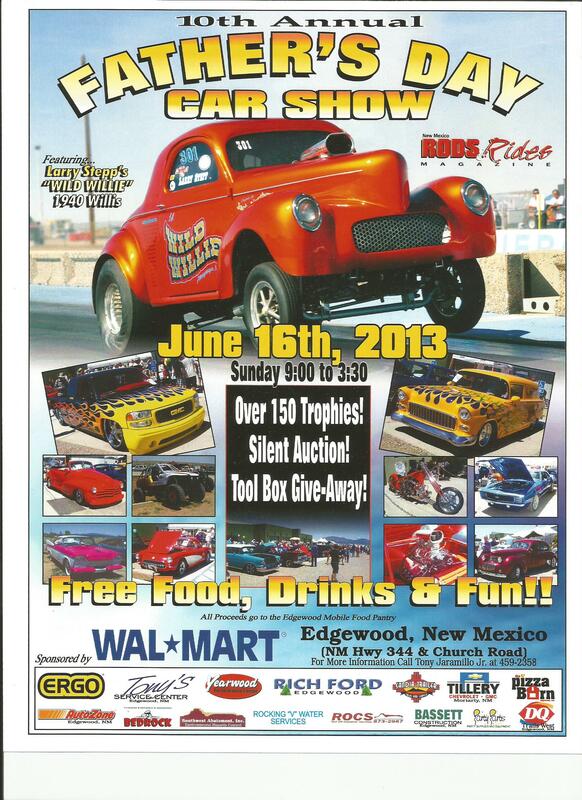 This year Tony Jaramillo Jr and his crew will stage the event at Edgewood’s Wal-Mart. This larger space developed after the Wal-Mart’s manager and the parent organization stepped forward to offer a paved area for the show. The proceeds for the event are to be donated to the Edgewood Mobile Food Pantry as has been the case for the last several years. Volunteers from Valley View, along with other community volunteers will be working to make this year’s show the best ever. The food pantry will continue to be held at Valley View Christian Church. The flyer found below, lists the major sponsors for the show, together with other information. Please call Tony Jaramillo Jr at 505-459-2358 for questions and please support the sponsors of this event. Last, but not least, there is no entry fee for car exhibitors!